The next day the family will enjoy an all-inclusive Encounter at Irukandji Shark & Ray Encounters topped off by an impressive seafood lunch at the Cookabarra Restaurant & Function Centre renowned for their sustainable farming techniques! Together is makes the most amazing prize: A holiday to Port Stephens for a family of 4! The competition is still going until the 11th of June and can be viewed further down this page so don’t miss out! Create a “Sea Shelter” (it could be a hat, an umbrella, anything) using your recycled material for ocean awareness. Post a pic of your creation on our Facebook page:https://www.facebook.com/seashelter.org/ between now and June 11th. 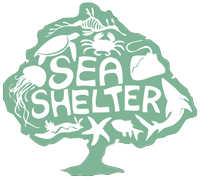 Click “Sign Up” on our Facebook (as a free Sea Shelter member). This competition is so easy and you get to raise awareness about marine debris along the way! Have a quick look around your house for recyclable materials and you are off! Check the competition video below for ideas Good Luck!